24 Things You 100% Did Not Notice In "Jurassic World"
Ian Malcolm's book, Disney references, tons of Jurassic Park nostalgia, and everything else you might have missed! 1. Toward the start of the film we see Claire's assistant, Zara, reading God Creates Dinosaurs, written by none other than Ian Malcom! The presence of his book suggests that Ian's character is alive and continuing to stir up controversy. Who knows, maybe he'll be part of the sequel? 2. Ian's book also shows up in the control room. 3. You might have noticed similarities between Lowery and Dennis from the first Jurassic Park movie but did you realize they wore identical watches and glasses? 4. Like Lowery says during the film, the park was totally overrun with corporate sponsors. The main auditorium is even named the "Samsung Innovation Center"! 5. But not all of the brands included on Main Street are real. Winston's Steakhouse was actually a a tribute to the late Stan Winston, who worked in special effects and animatronics in the previous Jurassic Park films. The Sunrio Tequila Bar is also a fictitious company. 6. Apparently Owen was a big fan of the Sunrio Tequila Bar. He's got one of their signs decorating his tiny house. 7. We all know Jurassic World was huge, but you probably didn't realize it had a water park! Imagine going down a water slide while surrounded by dinos! 8. There's a park employee named Elsa. Like the Disney princess! Coincidence? 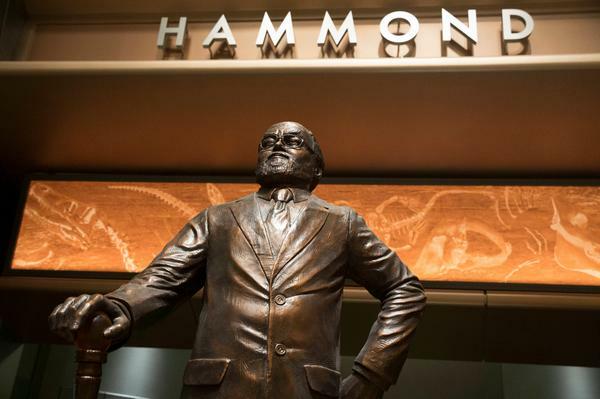 I doubt it...There are a ton of obvious references to Disney World throughout the film, like the bronze statue of John Hammond. This one's definitely more subtle, and easy to miss! 9. There's a quick reference to Malcom's original explanation of his Chaos theory when two blood droplets fall in opposite directions on the arm of the ACU commander. 10. When Owen approaches the crushed pod he sees one of the Indominus rex's teeth. However, just seconds before, the pod is shown but without any visible teeth present. So my question to you is this: Who planted the tooth? 11. Dr. Wu pretty much shuts down all of the haters of the science in Jurassic World during this exchange. 12. When Zach and Gray stumble upon the original Jurassic Park visitor center they're totally flanked by nostalgic references. Like the banner that Zach uses to create a torch. When dinosaurs ruled the Earth, baby! 13. Or the night vision goggles that got Tim and Lex into trouble, also during the first Jurassic Park. 14. You might have noticed that Zach and Gray revive Jeep 29, which was an obvious shout-out to the original Jurassic Park movie. But you probably didn't spot that Jeep 18 — also from the first JP — was in the shed as well. 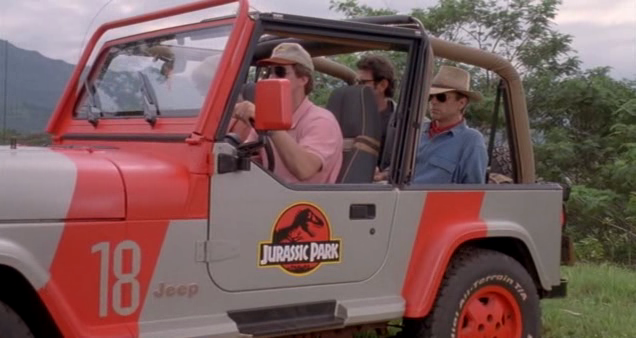 Jeeps 29 and 18 were both featured in the first Jurassic Park movie. Hammond and his lawyer rode in 29, while Alan and Ellie rode in 18. 15. Claire's shirt gets ripped for no reason. We see her running from the Indominus rex with her shirt intact, then a second later it's mysteriously ripped. 16. The fences are still electrified with 10,000 volts. 17. There was a pterosaur movie showing at the IMAX theaters when the pterosaurs attacked. 18. We see even more references to the first Jurassic Park movie later in Jurassic World. Like when Claire sees raptors in her rearview mirror. 19. Or these almost identical signs. Looks like the research facility at Jurassic World (left) is located near the East Dock from Jurassic Park (right). 20. Claire uses her phone frequently, but half the time it doesn't seem to be on. Notice how her phone appears dead even though she just began the call. It's odd because half of the time the phones are clearly illuminated, and you can even read visible numbers on the screens. Then other times the phones just seem dead? So confusing! 21. The Indominus rex wasn't the only genetic hybrid Dr. Wu was working on. Toward the end of the movie we see a brief glimpse of what appears to be a triceratops/stegosaurus hybrid. Even though a live version of this hybrid didn't make the final cut of the movie, we do see it for a quick second on a computer screen in the lab. 22. Although Jurassic World exists in a universe where the original sequels didn't happen, the skeleton of a spinosaurus (which was the main dinosaur in Jurassic Park III) in visible on Main Street. 23. And it seems to exist for exactly one purpose: To be OBLITERATED by the Tyrannosaurus rex. 24. Wonder why Rex looked familiar? It's because it's supposed to be the same dinosaur from the first Jurassic Park movie, and has the scars to prove it! Tyrannosaurus saves the day, yet again!